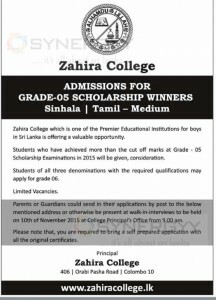 Zahira College which is one of the Premier Educational Institutions for boys in Sri Lanka is offering a valuable opportunity. Students who have achieved more than the cut off marks at Grade – 05 Scholarship Examinations in 2015 will be given, consideration. Students of all three denominations with the required qualifications may apply for grade 06. Parents or Guardians could send in their applications by post to the below mentioned address or otherwise be present at walk-in-interviews to be held on 10th November 2015 at College Principal’s Office from 9.00 am. Please note that, you are required to bring a self prepared application with all the original certificates.